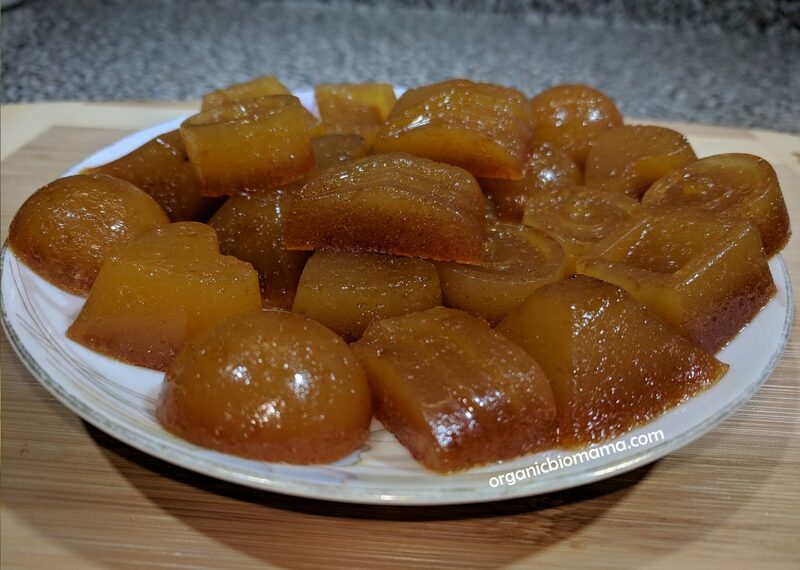 This fermented cod liver oil gummies recipe is a second version that I have tried so far. The first version calls for a separate FCLO and butter oil, this version uses a fermented cod liver oil blend. Not a big difference, but my gummies came out slightly different this time. I also used lecithin powder this time, not a liquid capsule one. Some children do not like taking their cod liver oil. Making gummies with cod liver oil might make them want to try it. These gummies will still smell like cod liver oil. If your child smells his food before eating, the gummy trick may not work. Every child is different, so… Try it and see for yourself. If you use another type of cod liver oil, there might not be any smell to it. This recipe uses FCLO blend. 3 Tbsp of FCLO is equal to 36 of 1/4 tsp OR 18 of 1/2 tsp. The serving size is 1/4-1/2 tsp of FCLO a day. The recipe makes 26 gummies if you use this silicone mold. Each gummy will contain more than 1/4 tsp and less than 1/2 tsp of FCLO. I hope it’s not confusing. Since cod liver oil is considered food, overdose is not an issue. Depending on your needs, 1 gummy a day will work for most. Pour the orange juice into a glass jar. Place the jar in a pot filled with water. Make sure the water does not come into contact with the juice. Place the pot into a medium fire. Add gelatin to the juice. Mix periodically until melted. Add lecithin to the mixture. Mix. Prepare the mold until the mixture melts and incorporates. Wash and dry a silicone mold. You can grease the mold, for any case, to make the gummies easier to pop out. When everything melts and incorporates, turn off the fire. Make sure the mixture is warm before adding the honey and FCLO (Fermented cod liver oil) butter oil blend. Add 2 Tbsp of honey, mix. Add 3 Tbsp of FCLO. Mix until incorporates. Pour the mixture into the mold. Place the filled mold into a fridge until gummies harden. About 20-30 minutes. Count the gummies. Divide the number to 3 Tbsp of FCLO. 3 tablespoons of FCLO is equal to 9 teaspoons or 36 of 1/4 teaspoons. The serving size is 1/4-1/2 tsp of FCLO a day. I got 26 gummies using my silicone mold. It means, in my case, 1 gummy will contain about 1/4-1/2 tsp of FCLO, so the serving size will be about one gummy a day. Keep the gummies in the fridge in a covered glass container.